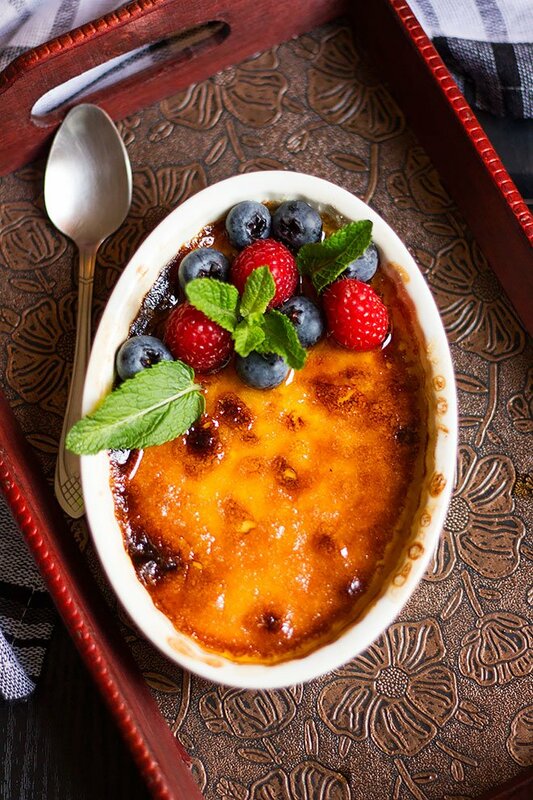 How to make Crème Brulee? 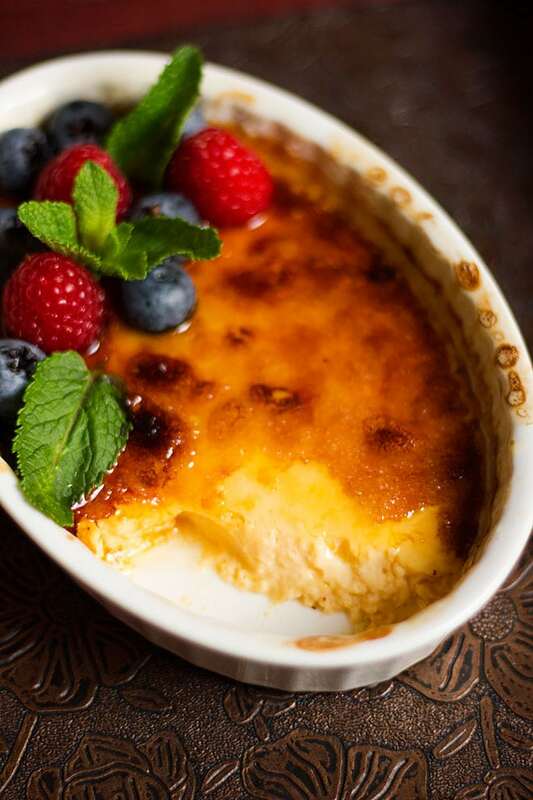 You need four ingredients to make crème Brulee; it is a straightforward recipe. You will need egg yolks, heavy cream, sugar, and vanilla. Some people mix all the ingredients and then pour the mixture in ramekins. I like to bring the cream to a simmer and then temper the eggs with it; this process makes the crème Brulee creamy in texture even after it is cool. To make the crème Brulee, separate the yolks from the whites. Add the sugar to yolks and beat until lighter in color. 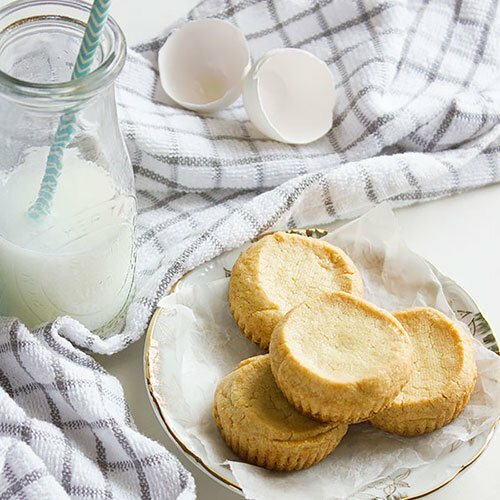 If you are using vanilla in a liquid form, then add it to the egg yolks when beating with the sugar. If you are using vanilla beans, then add it to the cream and let it the cream come to simmer. How to temper the Eggs? Turn off the heat and temper the egg by adding half a cup of cream to it while whisking and then add the rest of the cream and continue to whisk. The mixture will make two ramekins that are 7” long, 5” wide, and 1.5” deep. You will have to bake the crème Brulee for 30 minutes on 320F/160C. 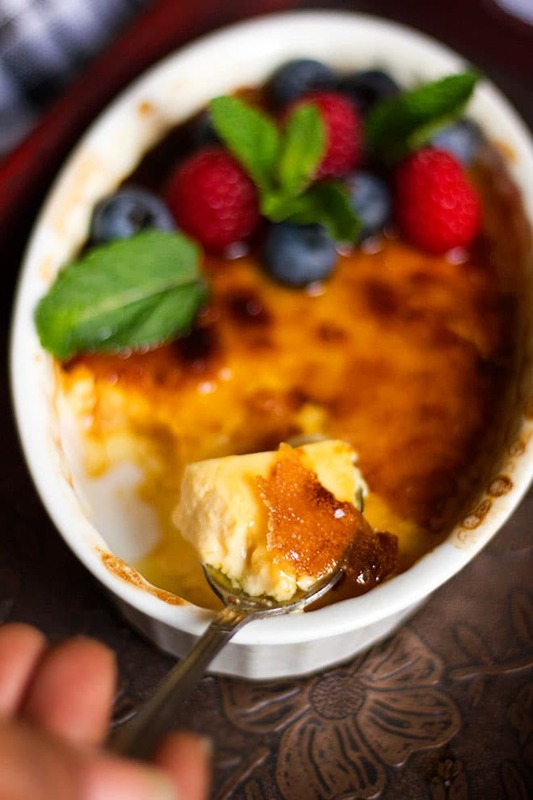 The center of the crème Brulee should Jiggle a little. 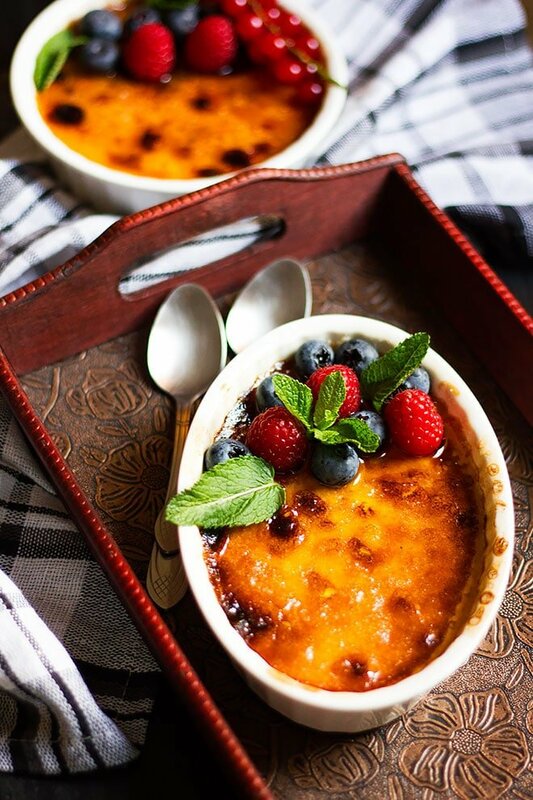 Let it cool and then refrigerate for 4 hours, spread the sugar on the crème Brulee and burn it using a torch or your oven’s burner, let it set again for few minutes and then serve. Can I make Crème Brulee in advance? Yes, you can bake the crème a day ahead, but sprinkle the sugar and burn it closer to the time you are going to serve it. Can I use milk instead of heavy cream in Crème Brulee? 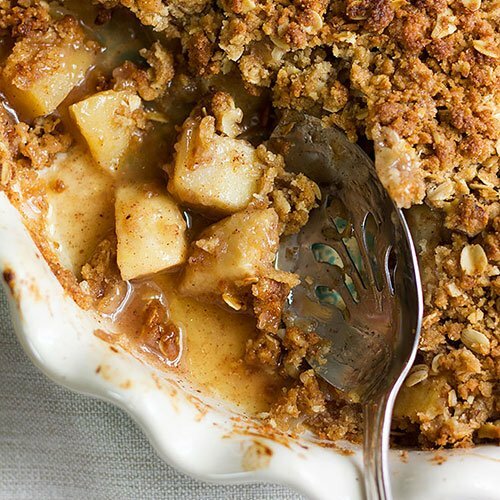 You can use whole milk, but the texture will not be as creamy. 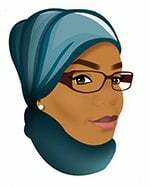 If you are out of heavy cream you can substitute by mixing whole milk with butter, one cup of heavy cream is a ¾ cup of milk mixed with three tablespoons melted butter. But I will not advise you to use this method in making crème Brulee if you did the butter will separate while baking and come to the surface, when you spread the sugar on the crème to burn it you will get a taste of Ghee (clarified butter). 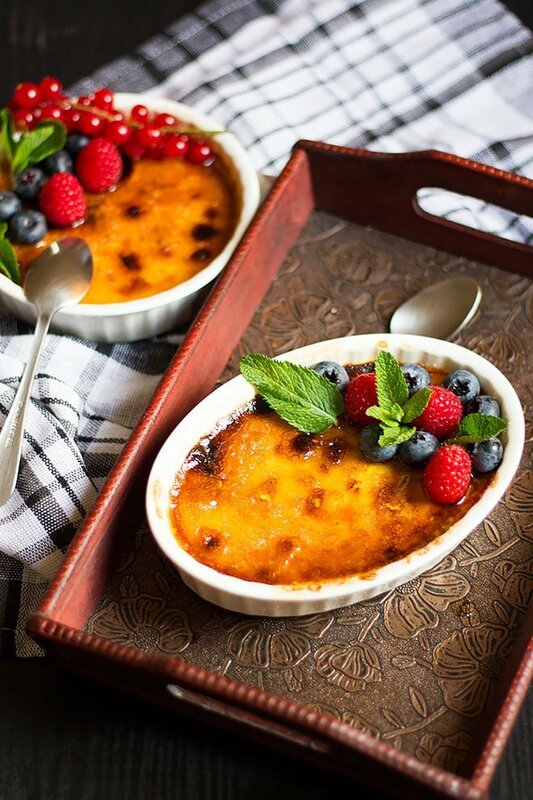 An easy to make dessert that will impress your guests, Creme Brulee is a delicious dessert that’s made using 4 ingredients only. Preheat oven to 320F/160C. You will need two ramekins that are 7” long, 5” wide, and 1.5” deep. Separate the egg yolks from the whites and place the yolks in a mixing bowl. Add the sugar and vanilla to the yolks and beat until lighter in color. In a saucepan, add the heavy cream and bring it to a simmer. Pour half a cup from the heavy cream to the egg mixture while whisking. Pour the rest of the cream to the egg yolk mixture and whisk to combine. Pour the crème in the ramekins and place in a water bath. Bake the creme for 30 minutes. Let the crème cool completely, cover with plastic wrap and place in the fridge for at least four hours. 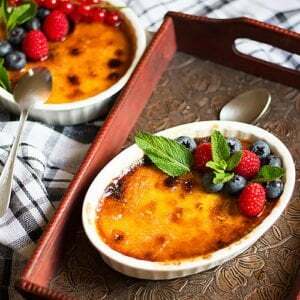 Before serving the crème make the Brulee, sprinkle one tablespoon sugar on the top of the crème and burn the sugar using a torch or place it under your oven’s burner until the sugar is caramelized. Let the crème Brulee set for 10 minutes before serving. This post was originally published in 2011 and updated with new images and text. This is dessert that I always admire and enjoy having it 🙂 Looks so nice.. Apparently my college at my university was meant to have invented the ‘Trinity Burnt Cream’, the original creme brulee, but I don’t know if that’s a tourist story or not, but either way, it’s delicious! I’ve always been too scared to make it as it seems really hard, but you’ve done a great job! Thanks, I hope that you try it and let me know how you did!